Located in the Sudirman Central Business District, the new development will feature 70 floors of class-A office space, a luxurious 290-room “Bellagio Hotel” and spa, a convention center with the capacity to accommodate 6,000 people and about 690,000 square feet of retail space. The structure will also include more than 50,000 square feet of Public Observatory space and six levels of structured below-grade parking for 3,001 vehicles. Behind the project is a joint venture between local business group Danayasa Arthatama and US firm MGM Hospitality. Danayasa Arthatama is part of the Artha Graha Network owned by prominent Indonesian businessman Tomy Winata, and the US partner is part of MGM Resorts International, a US-listed casino and hospitality group. “The presence of MGM will bring new color and a vibrant atmosphere to the Jakarta metropolis, so that it becomes equivalent to other metropolitan cities in the world,” Santoso Gunara, president of PT Danayasa Arthatama Tbk commented in a press statement. 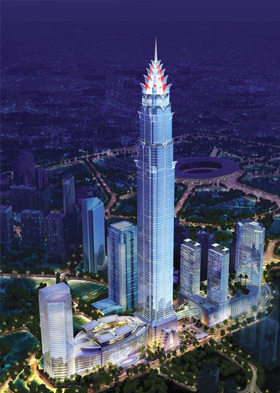 According to the Jakarta Post, financing for the Signature Tower project will consist of bank loans and internal cash, possibly at a 60 to 40 percent or 70 to 30 percent ratio. Construction is expected to start later this year or towards the beginning of next year. At full build-out, the new high-rise will overtake the 1483-square foot Petronas Towers in Kuala Lumpur, Malaysia, currently ranked as the region’s tallest structures. At the moment, the world’s tallest building is the 2717-foot Burj Khalifa in Dubai. By 2017 or 2018, the Kingdom Tower in Jeddah, Saudi Arabia will set the new record at 3280 feet. Jakarta is one of Asia’s fastest growing office rental markets. Last year, high-end office rents in the central business district increased by 35 percent. There are currently 70 skyscrapers in the city and the figures will more than double, reaching 150 by 2015. Occupancy is also increasing with the constant arrival of new foreign investors and the expansion of Indonesian companies.